Kenosha – Governor Scott Walker joined Colbert Packaging Corporation, a leading manufacturer of folding cartons, rigid setup boxes, and paperboard specialty products, today in unveiling plans to relocate its flexographic packaging operation and related warehousing services from northern Illinois to Kenosha. 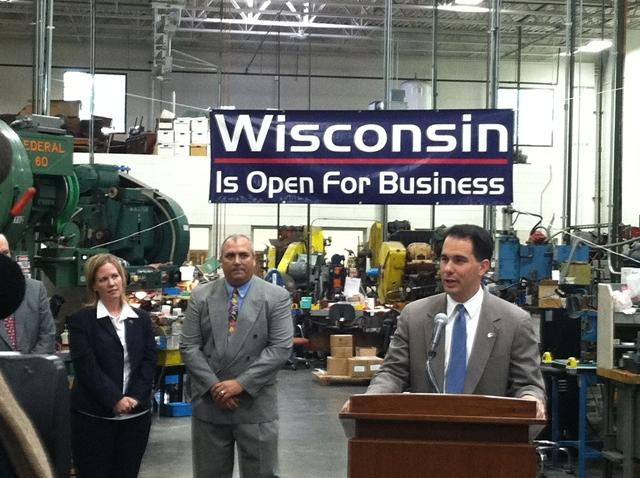 The project is anticipated to bring more than 100 new jobs to Wisconsin. Colbert is acquiring a new 173,000 square-foot building on 16 acres in the Business Park of Kenosha, which is located less than one mile from I-94. Colbert currently operates its flexographic division and warehouse from facilities in Illinois less than half that size. Hamilton said Kenosha County was a natural choice for Colbert due to its proximity to the company’s headquarters and major transportation hubs, as well as that state’s favorable business climate. Many of Colbert’s employees live along the Illinois-Wisconsin border and I-94 corridor, and some already call Kenosha County home. To help attract Colbert to Wisconsin, the Wisconsin Economic Development Corporation (WEDC) has authorized the company to receive up to $850,000 in state tax credits over the next three years. The actual amount of tax credits received, however, will be contingent upon the number of jobs created and the amount of capital investment the company makes during that time. Local officials anticipate the project will pay dividends in Kenosha County and beyond. Kenosha County provided $250,000 from its High Impact Fund to support the project. The High Impact Fund is designed to incentivize companies creating jobs in Kenosha County. Colbert Packaging is the latest company to establish operations in Kenosha County. Since the beginning of 2013, major economic development projects accounting for more than 6,000 new jobs and about $1 billion of capital investments have been announced, completed, or are underway in the county. Companies that have new facilities in Kenosha County include Amazon, ULINE, InSinkErator, Meijer, Niagara Bottling, and Gourmet Foods International. In addition to the 108 jobs expected to be created by Colbert, an economic modeling study estimates the project could indirectly generate 67 additional jobs in the region. Those 175 new jobs are expected to generate up to $1.5 million in state income tax revenue over a five-year period. The Colbert Packaging announcement comes as more than a dozen state agencies and organizations are marking Manufacturing Month with events throughout October.